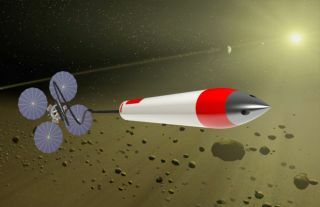 Artist's concept of a tethered "penetrator" heading toward a celestial body to take a sample. Why bother landing softly on an alien world to collect samples if you can just snag material with a harpoon from afar? Using a set of long-lined, hard-hitting harpoons would allow a mission to grab large samples from multiple locations on an asteroid or moon — and to get them from beneath the surface, where some of the most interesting material lies, say researchers developing the idea. "Moreover, it offers the opportunity to take multiple samples (from either multiple objects or from multiple areas of a few objects) at little extra cost so that it will provide much greater flexibility and greatly enhance the science return for any given mission," they added. A new paradigm for sample-return? While robotic spacecraft are getting more and more capable and independent, scientists are still keen to bring extraterrestrial material back to the lab for analysis. There's just no substitute for human expertise, they say — and there's no way to pack all of the instruments in a typical university lab onto a space probe. The standard way to do a robotic sample-return mission is to perform a soft landing on a celestial object, collect small amounts of material and then blast off toward Earth once again. Japan's Hayabusa probe employed this strategy, for example, when it chased down the asteroid Itokawa in 2005. "We're not talking about doing that," Winglee said earlier this month at the 2014 NASA Innovative Advanced Concepts (NIAC) symposium at Stanford University. "We're talking about using the kinetic energy of the spacecraft as it's moving past the object, and we're not asking the system to brake, so you save energy and delta v [change in velocity]." The team's concept currently calls for a sample-return spacecraft to carry six lightweight, rocket-shaped "penetrators," which would be swung down at the target object(s) from orbit or during a flyby using a miles-long space tether. The six-shooter approach enables the collection of multiple samples — an enticing prospect for scientists, Winglee said. "Going to one spot is both expensive and typically will raise more questions than it answers," he said. "There's a lot of cost reduction in doing multiple ones [samples], and the scientific return will be geometric at least, because then you've got several samples from different points, and you can actually see what the homogeneities in the system are." Solar system bodies that could be the target of a "hard landing" sample-return mission range from tiny asteroids all the way up to bodies as large as Jupiter's moon Europa and the planet Mercury, the researchers wrote in their NASA report. A tether-penetrator system could also be used on Earth to take samples from extreme or hazardous environments, such as the inside of a volcano or ground contaminated by a nuclear accident, Winglee said. Winglee's team has received two rounds of NIAC funding in the last two years to advance their research. Part of the work involves devising and testing energy-absorbing materials that can withstand the tremendous forces a penetrator will experience when it crashes into its target body. They've made significant progress in this respect, team members said. For example, prototypes that were slammed into the ground during field tests in Nevada's Black Rock Desert last year performed well at impact speeds of 450 mph and 900 mph (725 km/h and 1,450 km/h). "Because of the innovations that we've been working on, we're actually getting really, really close to having a penetrator that can survive a well over 1,000-meter-per-second impact," said team member Chad Truitt, also of the University of Washington. Winglee and his colleagues hope that further success will bring in more money, allowing them to mount a much more elaborate and telling test. "We would love to go to do a realistic one in space, but that's not cheap," Winglee said. "I think that when we demonstrate that we can survive a 1-kilometer-per-second impact and pull sample out, then I think we would hope that the NASA supporters would say, 'That is something that should really be tried in space.'"